With the holiday’s upon us, there is even more reason to be bold and rock a red suit. Basically, what I’m saying is that this is what I think you should wear to work today haha! I got this exact pant suit when my mum and I were in Aruba last month. My mom actually got it for me (thanks Mum!) so I like it even more knowing that my OG Girl boss mom likes it :). Because I got my suit in Aruba I can’t link it up for you but, Alice & Olivia has a gorgeous red pant suit right now (and it’s on sale) and Norma Kamali also has a red pant suit in velvet – which is so freaking stunning! 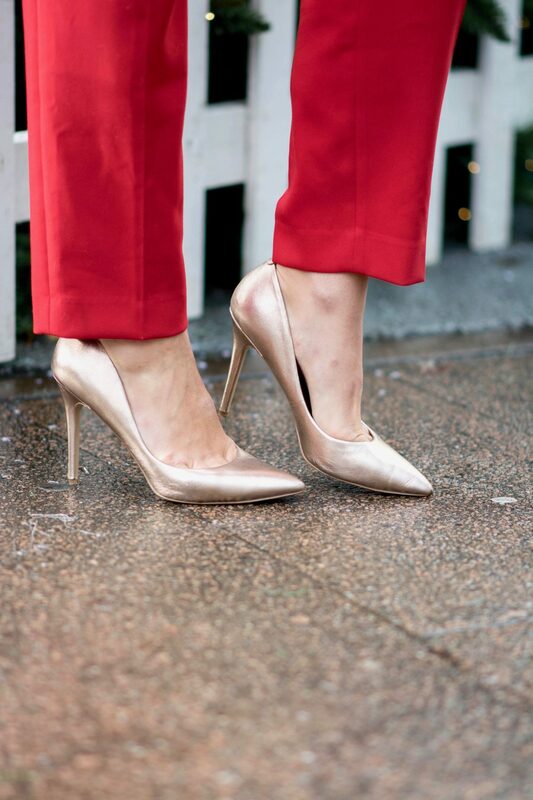 To go with this holiday-ready suit I went with my rose gold heels. Red & rose gold is not a combination I would have instinctvely gone for, but at New York Fashion Week this fall I saw a lot of red and rose gold paired together so I have been trying it out recently and I love the look. It’s a unique combination but it does look polished which is perfect for a pairing with a women’s red pant suit. Also – my rose gold heels are actually on sale at the moment for less than $50!! I so, so, recommend you get a pair of these! Rose gold heels are something you can wear throughout the holiday season with so many outfits and they are a great way to add a bit of a glam to any outfit. I wanted to keep my accessories simple for this look, and so I went with my Victoria Emerson pendant necklace. What I love about this piece is that it is dainty enough to wear to the office, but it’s unique. The stone is such a cool, earthy touch. Do you like the necklace? Well then good news! (That was such a lame line tie-in, haha sorry guys!) The good news is that for day 3 of my 12 Days of Giveaways, I am giving one reader 2 necklaces and 1 bracelet of their choosing from Victoria Emerson. You can get any necklace or bracelet from their site! And the reason it’s not just 1 necklace and 1 bracelet is I wanted to give you something for you but also something you can give as a Christmas gift! 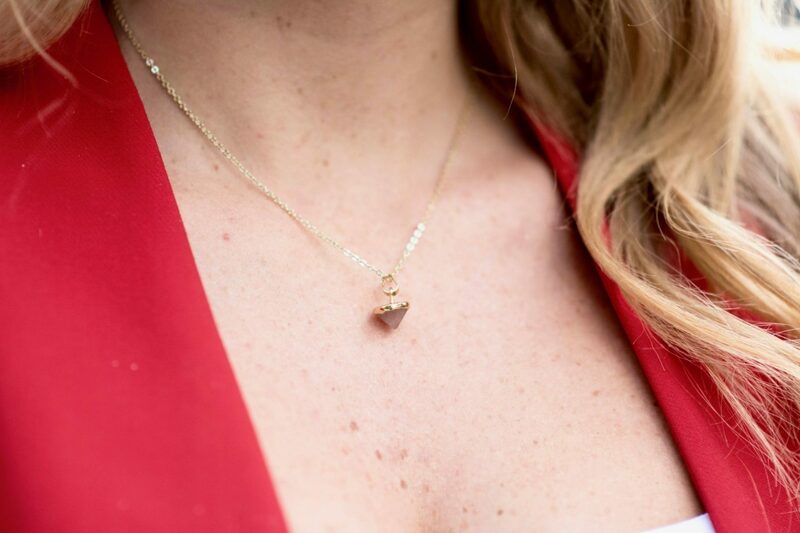 A Victoria Emerson necklace would be such a great gift for a friend or sister; especially since you can pick whatever one you think best suits them! "Gift Guide: Gifts for Your Mom"
You look stunning in this red suit!! Red is certainly a power color, and this suit looks amazing on you! I also love your Victoria Emerson necklace – it’s a fabulous piece! Omg this red suit is AMAZING! Seriously a power suit and you look incredible in it! Not everyone can carry off that color and monochrome look – but you wear it so well. Love the length of the pants, which is always tricky for me. Oh those heels! I am loving this outfit, I love the red with the tone downed accessories. You look gorgeous. Such a fab necklace giveaway. 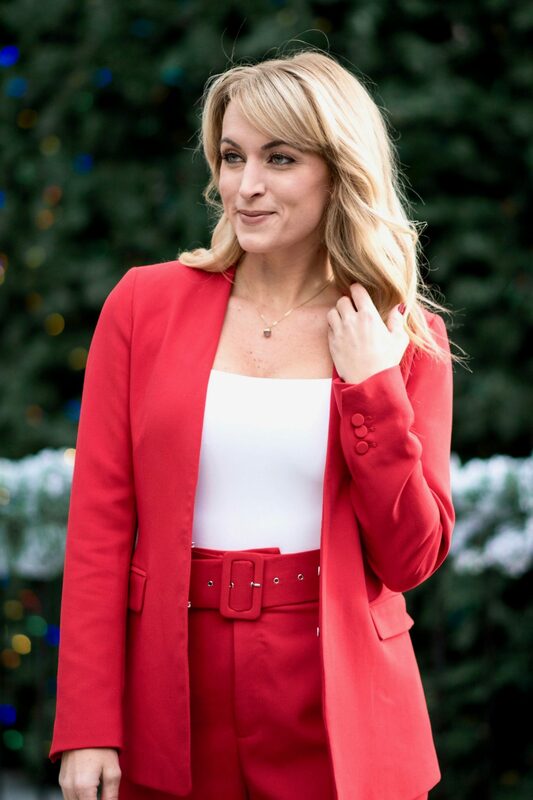 And this red pant suit is the perfect look for December. Strong yet festive, especially with the heels. Totally getting Good Wife vibes in this suit (love that show!!). You look AMAZING! Aw thank you! And i know, it was such a great show!! It’s been so long since I’ve worn a pants suit but I am loving this chic ensemble!! Ow ow! You are looking fierce as fire in this red pantsuit, girlfriend! Total girlboss material, that’s for sure. Perfect for wowing during the holidays. This red pant suit is GORGEOUS! Love the color and the fit on you. This is such a stunning suit! I love the fit of this one and the color is so perfect for the holiday season. So chic and classy. That’s a perfect work wear look. I love the red for the Holidays! It’s so festive and so bold! Such a great look for work and so bold & festive! !